This study argues that dominant teleconnection patterns influenced winter weather and climate over North America associated with the extreme cold winter of 2013/14. Air temperatures and atmospheric circulations over North America have been associated with many teleconnection patterns: Arctic Oscillation (AO), Pacific-North American (PNA) and El Niño-Southern Oscillation (ENSO). The AO is associated with extreme temperature events over the north eastern United States and south eastern Canada [1Wettstein JJ, Mearns LO. The influence of the North Atlantic-Arctic Oscillation on mean, variance, and extremes of temperature in the northeastern United States and Canada. J Clim 2002; 15: 3586-600. [http://dx.doi.org/10.1175/1520-0442(2002)015<3586:TIOTNA>2.0.CO;2] ]. The PNA pattern is associated with the Aleutian Low and influences temperature anomalies over western Canada and the south eastern United States [2Wallace JM, Gutzler DS. Teleconnections in the geopotential height field during the Northern Hemisphere winter. Mon Weather Rev 1981; 109: 784-812. [http://dx.doi.org/10.1175/1520-0493(1981)109<0784:TITGHF>2.0.CO;2] ]. Extreme temperatures over North America are associated strongly with the PNA and AO patterns and more weakly associated with ENSO [3Loikith PC, Broccoli AJ. The influence of recurrent modes of climate variability of the occurrence of winter and summer extreme temperatures over North America. J Clim 2014; 27: 1600-18. [http://dx.doi.org/10.1175/JCLI-D-13-00068.1] ]. The duration of winter cold patterns decreased over most of southern Canada during the El Niño winter mode [4Shabbar A, Bonsal B. Associations between low frequency variability modes and winter temperature extremes in Canada. Atmos-ocean 2004; 42(2): 127-40. [http://dx.doi.org/10.3137/ao.420204] , 5Yu B, Zhang X, Lin H, Yu J-Y. Comparison of wintertime North America climate impacts associated with multiple ENSO indices. Atmos-ocean 2015; 53(4): 426-45. During the winter of 2013/14 central North America and the Eastern United States were abnormally cold [6van Oldenborgh GJ, Haarsma R, de Varies H, Allen MR. Cold extremes in North America vs. mild weather in Europe: the winter of 2013-2014 in the context of a warming world. Bull Am Meteorol Soc 2015; 95: 707-14. [http://dx.doi.org/10.1175/BAMS-D-14-00036.1] ] with abnormally persistent cold temperatures [7Wallace JM, Held IM, Thompson DWJ, Trenberth KE, Walsh JE. Global warming and winter weather. Science 2014; 343(6172): 729-30. 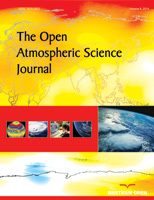 [http://dx.doi.org/10.1126/science.343.6172.729] [PMID: 24531953] -9Screen JA, Deser C, Sun L. Reduced risk of North American cold extremes due to continued Arctic sea ice loss. Bull Am Meteorol Soc 2015; 96(9): 1489-503. [http://dx.doi.org/10.1175/BAMS-D-14-00185.1] ]. A number of previous studies have indicated that the atmospheric patterns during winter 2013/14 resembled the Pacific pattern and the North Pacific Oscillation/Western Pacific (NPO/WP) pattern [10Lee MY, Hong CC, Hsu HH. Compounding effects of warm sea surface temperature and reduced sea ice on the extreme circulation over the extratropical North Pacific and North America during the 2013-2014 boreal winter. Geophys Res Lett 2015; 42: 1612-8. [http://dx.doi.org/10.1002/2014GL062956] , 11Yu B, Zhang X. A physical analysis of the severe 2013/2014 cold winter in North America. J Geophys Res Atmos 2015; 120: 10149-65. [http://dx.doi.org/10.1002/2015JD023116] ]. The atmospheric circulations were induced by positive sea surface temperature (SST) anomalies in the tropical Pacific and the extratropical North Pacific [10Lee MY, Hong CC, Hsu HH. Compounding effects of warm sea surface temperature and reduced sea ice on the extreme circulation over the extratropical North Pacific and North America during the 2013-2014 boreal winter. Geophys Res Lett 2015; 42: 1612-8. [http://dx.doi.org/10.1002/2014GL062956] , 12Hartmann DL. Pacific sea surface temperature and the winter of 2014. Geophys Res Lett 2015; 42: 1894-902. [http://dx.doi.org/10.1002/2015GL063083] , 13Seager R, Hoerling M, Schubert S, et al. Causes of the 2011-14 California drought. J Clim 2015; 28: 6997-7024. [http://dx.doi.org/10.1175/JCLI-D-14-00860.1] ]. Strong positive anomalies in SST were observed over the North Pacific and North Atlantic during winter 2013/14 [14Bond NA, Cronin MF, Freeland H, Mantua N. Causes and impacts of the 2014 warm anomaly in the NE Pacific. Geophys Res Lett 2015; 42: 1-7. [http://dx.doi.org/10.1002/2015GL063306] , 15Grist JP, Josey SA, Jacobs ZL, Marsh R, Sinha B, Sebille EV. Extreme air-sea interaction over the North Atlantic subpolar gyre during the winter of 2013-2014 and its sub-surface legacy. Clim Dyn 2015; 42: 1-19. Available from: http://link.springer.com/article/10.1007/ s00382-015-2819-3]. These SST anomalies were connected with the atmospheric pattern in winter 2013/14. The NPO/WP pattern was a major driver behind the SST anomalies in the North Pacific [11Yu B, Zhang X. A physical analysis of the severe 2013/2014 cold winter in North America. J Geophys Res Atmos 2015; 120: 10149-65. The aim of this paper is to investigate the impact of atmospheric teleconnection patterns, specifically the East Atlantic (EA) and Tropical Northern Hemisphere (TNH) patterns, on the anomalously cold winter over North America during 2013/14. The EA and TNH indices are chosen because they exhibit higher values in winter 2013/14; the EA index reached its highest level while the TNH index reached its second highest level during the period from 1951-2014 (Fig. 1 ). The EA pattern is the second leading climate mode in the North Atlantic Ocean and is characterized by a north-south dipole anomaly located to the south of Iceland, which spans across the North Atlantic from east to west [2Wallace JM, Gutzler DS. Teleconnections in the geopotential height field during the Northern Hemisphere winter. Mon Weather Rev 1981; 109: 784-812. [http://dx.doi.org/10.1175/1520-0493(1981)109<0784:TITGHF>2.0.CO;2] , 16Barnston AG, Livezey RE. Classification, seasonality and persistence of low-frequency atmospheric circulation patterns. Mon Weather Rev 1987; 115: 1083-126. [http://dx.doi.org/10.1175/1520-0493(1987)115<1083:CSAPOL>2.0.CO;2] ]. Previous research has shown that the EA pattern influences spring ice cover in Hudson Bay [17Tivy A, Alt B, Howell S, Wilson K, Yackel J. Long-range prediction of the shipping season in Hudson Bay: a statistical approach. Weather Forecast 2007; 22: 1063-75. [http://dx.doi.org/10.1175/WAF1038.1] ] and air temperatures over Western Europe [18Moore GWK, Renfrew IA. Cold European winters: interplay between the NAO and the East Atlantic mode. Atmos Sci Lett 2012; 13: 1-8. [http://dx.doi.org/10.1002/asl.356] ]. The TNH pattern appears as a tripole anomaly over the Gulf of Alaska, eastern Canada and the western North Atlantic [19Mo KC, Livezey RE. Tropical-extratropical geopotential height teleconnections during the Northern hemisphere winter. Mon Weather Rev 1986; 114: 2488-515. [http://dx.doi.org/10.1175/1520-0493(1986)114<2488:TEGHTD>2.0.CO;2] ]. The TNH pattern has a large impact on the atmospheric circulation and temperature anomalies over North America [16Barnston AG, Livezey RE. Classification, seasonality and persistence of low-frequency atmospheric circulation patterns. Mon Weather Rev 1987; 115: 1083-126. [http://dx.doi.org/10.1175/1520-0493(1987)115<1083:CSAPOL>2.0.CO;2] , 19Mo KC, Livezey RE. Tropical-extratropical geopotential height teleconnections during the Northern hemisphere winter. Mon Weather Rev 1986; 114: 2488-515. [http://dx.doi.org/10.1175/1520-0493(1986)114<2488:TEGHTD>2.0.CO;2] ]. In this paper, we argue that the combined effects of the EA and TNH teleconnection patterns may have played an important role in the observed atmospheric circulation patterns over North America during the winter of 2013/14 and fostered the anomalously cold air temperatures during winter 2013/14. Time series of the standardized winter EA (bars) and TNH (open circles) indices from 1951 to 2014. [http://dx.doi.org/10.1175/1520-0477(1996)077<0437:TNYRP>2.0.CO;2] ]. Several teleconnection patterns were initially analyzed for this work, but the East Atlantic (EA) and Tropical/Northern Hemisphere (TNH) indices were the only two to show anomalous values during the winter of 2013/14, thus they comprise the focus of this study. Both indices were retrieved for the duration of the study period from the NCEP Climate Prediction Centre (http://www.cpc.ncep.noaa.gov/data/teledoc/telecontents.shtml). Within this study the combined EA and TNH index is defined as the standardized EA plus TNH indices or as we refer to it “the EA + TNH index”. The positive EA + TNH index corresponds to the combined positive phase of the EA and positive phase of the TNH. Sea surface temperature (SST) data used in this study are based on the Met Office Hadley Centre’s SST data version 1 (HadISST1) provided as monthly fields from 1951 to 2014 [21Rayner NA, Parker DE, Horton EB, et al. Global analyses of sea surface temperature, sea ice, and night marine air temperature since the late nineteenth century. J Geophys Res 2003; 108(D14): 2156-202. [http://dx.doi.org/10.1029/2002JD002670] ]. Here, “winter” is defined as December-January-February (DJF), and winter 2014 includes December 2013. To investigate the relationship between the EA and TNH patterns, we show in Fig. (2 ) a scatterplot of the EA and TNH indices for the period of record 1951-2014. Fig. (2 ) again shows that the EA and TNH were at their highest and second highest values, respectively, during the winter of 2013/14. The two indices also had similar magnitudes (EA = 1.6 and TNH = 1.2) during the winter of 2013/14, whereas previous coincident positive indices appear to be rare. Figs. 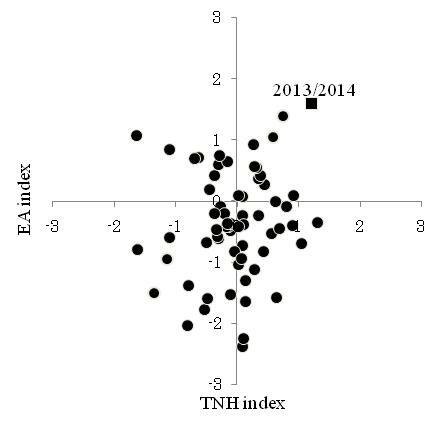 (1 and 2 ) show clearly that positive phases of both the EA and TNH were dominant in winter 2013/14. Scatterplot of the EA index versus the TNH index during the period from 1951 to 2014. A black square is winter 2013/14. To assess the contribution of both EA and TNH teleconnection patterns to atmospheric circulation associated with the cold winter in 2013/14, Fig. (3 ) (top row) shows anomalies in geopotential height at 500-hPa (Z500, Fig. (3a )) and air temperature at 850-hPa (T850, Fig. (3b )) for winter 2013/14. Fig. (3 ) (bottom row) shows the patterns of the Z500 (Fig. 3c ) and T850 (Fig. 3d ) regressed on the EA + TNH index over the period of record 1951-2014. The winter anomalies in 2013/14 show that negative Z500 anomalies (Fig. 3a ) are notable over North America and the North Atlantic Ocean, and positive anomalies are present over the North Pacific Ocean and the mid-latitude Atlantic Ocean. The T850 pattern in winter 2013/14 (Fig. 3b ) consists of cold anomalies of up to -6°C over North America and warm anomalies of up to 3°C over the North Pacific Ocean and the mid-latitude Atlantic Ocean. The EA + TNH pattern (Fig. 3c ) shows negative anomalies over North America and the North Atlantic Ocean, and positive anomalies over the North Pacific Ocean and the mid-latitude Atlantic Ocean. The pattern is quite similar to the atmospheric anomalies of winter 2013/14 (Fig. 3a ). The T850 anomalies regressed on the EA + TNH index (Fig. 3d ) is also similar to the air temperature anomalies of winter 2013/14 (Fig. 3b ). Fig. (4 ) shows the patterns of the Z500 and T850 anomalies regressed upon the individual EA (top row) and TNH (bottom row) indices. The Z500 pattern regressed on the EA index (Fig.4a ) has negative anomalies over the North Atlantic Ocean and positive anomalies over western North America, the mid-latitude Atlantic Ocean and Europe. The T850 regression pattern of the EA index (Fig. 4b ) is negative over central North America and the North Atlantic Ocean, with positive anomalies over northern North America, the mid-latitude Atlantic and Europe. The Z500 pattern regressed on the TNH index shown in Fig. (4c ) is characterized by negative anomalies that span from central north America to the northeast towards Greenland and Iceland, and positive anomalies over the west coast of North America and the south-eastern coast of North America that extends into the mid-Atlantic. The T850 pattern regressed on the TNH index (Fig. 4d ) is quite similar to the Z500 pattern. The strong negative T850 anomalies over North America are more apparent in the regression pattern of the TNH index (Fig. 4d ) than the pattern of the EA index (Fig. 4b ). However, the EA + TNH pattern (Fig. 3d ) is quite similar to the T850 anomalies in winter 2013/14 (Fig. 3b ). Therefore, we conclude that the winter EA + TNH is strongly connected with the cold winter in 2013/14 over North America. Anomalies of the Z500 (m, left column) and T850 (C°, right column) for winter 2013/14 (top row) and regressed on the EA+TNH index (bottom row). Anomalies for winter 2013/14 are calculated relative to the mean from 1981 to 2010. A red box in Fig. (3b ) is 70°-110°W longitude and 45°-60°N latitude. As in Fig. (3 ) but the Z500 and T850 regressed on the EA index (top row) and the TNH index (bottom row). The standardized time series during winter (DJF) of T850 over North America (Fig. 3b , red box) and the EA + TNH are shown in Fig. (5 ). During the winter of 2013/14 the T850 index (solid line) reached its lowest value, indicating the coldest winter of the 1951 to 2014 study period, and the EA + TNH index (dotted line) reached its highest positive value for the same study period (Fig. 5 ) and shows that the winter temperature over North America was coldest during the winter of 2013/14 for the period between 1951 and 2014. The result points out that the positive EA + TNH pattern in 2013/14 is dominated by the winter atmospheric pattern of 2013/14. The correlation coefficient between the indices of T850 over North America and the EA + TNH is R= -0.37 (p < 0.01). In general a high EA + TNH (i.e. 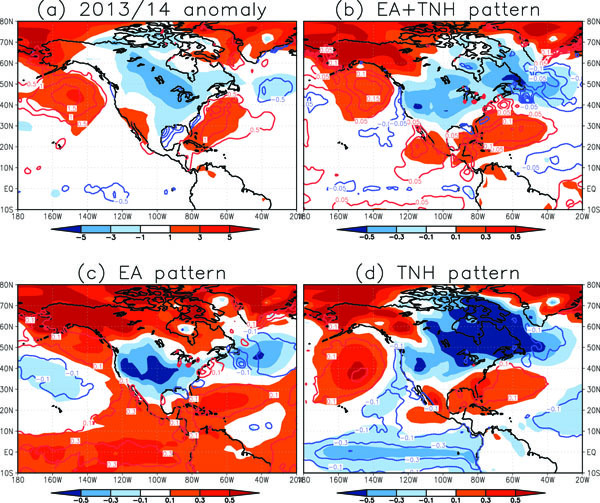 1989/90, 2006/07, 2008/09) corresponds with colder T850 anomalies over North America, while a low EA + TNH (i.e. 1955/56, 1967/68, 1968/69) corresponds with warmer winters of North America. However, the relationship is not perfect, as a high EA + TNH index during 2006/07 was coupled with a warmer winter over North America. Standardized time series of the T850 over North America (solid line, red box in Fig. (3b ) and the EA+TNH (dotted line). (a) T2m (C°, colors) and SST (C°, contours) anomalies during winter 2013/14. Anomalies are calculated relative to the mean from 1981 to 2010. (b) Regression pattern of the T2m and SST regressed on the EA+TNH index. (c) As in Fig. (6b ) but regressed on the EA index. (d) As in Fig. (6b ) but regressed on the TNH index. Fig. (6 ) shows T2m and SST anomalies for winter 2013/14 and regression patterns of T2m and SST on the EA + TNH, EA and TNH time series over the study period. In the winter of 2013/14, T2m anomalies (Fig. (6a ), colors) show not only negative anomalies over North America but also positive anomalies over the North Pacific Ocean, the Bering Strait, the western North Atlantic Ocean and Greenland. The winter SST anomalies in 2013/14 (Fig. (6a ), contours) are positive over the North Pacific and the western North Atlantic. Both SST (contours) and T2m (colors) anomalies regressed on the EA + TNH index (Fig. 6b ) are similar to these anomalies of winter 2013/14 (Fig. 6a ). The negative T2m anomalies regressed on the EA (Fig. 6c ) and TNH (Fig. 6d ) indices are strong over central North America and eastern North America, respectively. The influence of both EA and TNH patterns, that is, the EA + TNH (Fig. 6b ) influences the T2m anomalies in winter 2013/14 (Fig. 6a ). In the winter of 2013/14, strongly positive SST anomalies were enhanced in the northeast Pacific Ocean and the northwest Atlantic Ocean [14Bond NA, Cronin MF, Freeland H, Mantua N. Causes and impacts of the 2014 warm anomaly in the NE Pacific. Geophys Res Lett 2015; 42: 1-7. [http://dx.doi.org/10.1002/2015GL063306] , 15Grist JP, Josey SA, Jacobs ZL, Marsh R, Sinha B, Sebille EV. Extreme air-sea interaction over the North Atlantic subpolar gyre during the winter of 2013-2014 and its sub-surface legacy. Clim Dyn 2015; 42: 1-19. Available from: http://link.springer.com/article/10.1007/ s00382-015-2819-3]. In this paper, we indicate that the positive EA and TNH pattern is correlated with the warm SSTs over the North Pacific and North Atlantic Oceans. During winter 2013/14, North America experienced abnormally cold temperatures with record lows from 1951 to 2014, and these anomalously cold temperatures persisted until spring 2014. We have provided evidence that the large-scale atmospheric circulation pattern over North America during winter 2013/14 was dominated by the EA and TNH teleconnection patterns. The EA and TNH indices in winter 2013/14 exhibited the highest and the second highest level during the period of 1951-2014, respectively. Focusing on the association of the EA and TNH teleconnection patterns and the dominant atmospheric circulation in winter 2013/14 plays an important point in the observed patterns. During winter 2013/14 the Z500 and T850 patterns are characterized by negative anomalies over North America and the North Atlantic Ocean and positive anomalies over the North Pacific Ocean and the mid-latitude Atlantic Ocean. The Z500 anomalies in winter 2013/14 are similar to the positive EA + TNH teleconnection pattern. This relationship is not only present during the abnormally cold winter of 2013/14, but also holds for the entire study period as the standardized T850 over North America and the EA + TNH index are significantly negatively correlated (p < 0.01). The positive EA + TNH pattern is also correlated with the warm SST over the North Pacific Ocean and the North Atlantic Ocean (Fig. 6b ). Bond et al. (2015) [14Bond NA, Cronin MF, Freeland H, Mantua N. Causes and impacts of the 2014 warm anomaly in the NE Pacific. Geophys Res Lett 2015; 42: 1-7. [http://dx.doi.org/10.1002/2015GL063306] ] showed positive SST anomalies developed in the northeast Pacific Ocean during the winter of 2013/14, which they ascribe to strongly positive anomalies in sea level pressure, which suppressed the loss of heat from the ocean to the atmosphere. Grist et al. (2015) [15Grist JP, Josey SA, Jacobs ZL, Marsh R, Sinha B, Sebille EV. Extreme air-sea interaction over the North Atlantic subpolar gyre during the winter of 2013-2014 and its sub-surface legacy. Clim Dyn 2015; 42: 1-19. Available from: http://link.springer.com/article/10.1007/ s00382-015-2819-3] indicated the strongest anomalies in the net surface heat flux were located in the North Atlantic subpolar gyre region during the winter of 2013/14. The exceptional heat loss in the northeast Atlantic was associated with anomalously strong northwesterly winds, and brought abnormal cold air to North America from the north Atlantic. The positive SST anomalies over the North Pacific and the air-sea interaction over the North Atlantic in the winter of 2013/14 may correlate with the positive EA and TNH teleconnections patterns. It is well known that tropical SST anomalies are connected with winter weather in the extra-tropics [22Horel JD, Wallace JM. Planetary-scale atmospheric phenomena associated with the Southern Oscillation. Mon Weather Rev 1981; 109: 813-29. [http://dx.doi.org/10.1175/1520-0493(1981)109<0813:PSAPAW>2.0.CO;2] ], and the ENSO and extra-tropical North Pacific SST variabilities have been associated with temperature variation over North America [5Yu B, Zhang X, Lin H, Yu J-Y. Comparison of wintertime North America climate impacts associated with multiple ENSO indices. Atmos-ocean 2015; 53(4): 426-45. [http://dx.doi.org/10.1080/07055900.2015.1079697] , 23Alexander MA, Bladé I, Newman M, Lanzante JR, Lau NC, Scott JD. The atmospheric bridge: The influence of ENSO teleconnections on air-sea interaction over the global oceans. J Clim 2002; 15: 2205-31. [http://dx.doi.org/10.1175/1520-0442(2002)015<2205:TABTIO>2.0.CO;2] -25Wang SY, Hipps L, Gillies RR, Yoon JH. Probable causes of the abnormal ridge accompanying the 2013-2014 California drought: ENSO precursor and anthropogenic warming footprint. Geophys Res Lett 2014; 41: 3220-6. [http://dx.doi.org/10.1002/2014GL059748] ]. A number of previous studies have concluded that the anomalous atmospheric pattern and temperature anomalies in 2013/14 over North America were connected to SST anomalies over the North Pacific and the tropical Pacific [10Lee MY, Hong CC, Hsu HH. Compounding effects of warm sea surface temperature and reduced sea ice on the extreme circulation over the extratropical North Pacific and North America during the 2013-2014 boreal winter. Geophys Res Lett 2015; 42: 1612-8. [http://dx.doi.org/10.1002/2014GL062956] -13Seager R, Hoerling M, Schubert S, et al. Causes of the 2011-14 California drought. J Clim 2015; 28: 6997-7024. [http://dx.doi.org/10.1175/JCLI-D-14-00860.1] , 25Wang SY, Hipps L, Gillies RR, Yoon JH. Probable causes of the abnormal ridge accompanying the 2013-2014 California drought: ENSO precursor and anthropogenic warming footprint. Geophys Res Lett 2014; 41: 3220-6. [http://dx.doi.org/10.1002/2014GL059748] ]. However, the SST in the tropical area in the winter of 2013/14 showed little to no anomalies (Fig. (6a ), contours). We confirm that SST and T2m are associated with each of the EA and TNH patterns. Both the EA and TNH patterns are correlated with the tropical SST and T2m anomalies (Figs. 6c and d ). The results show that the positive phase of the EA is associated with the positive tropical SST and T2m anomalies. On the other hand, the positive TNH pattern is associated with negative tropical SST and T2m anomalies. As we have shown, both the positive EA and positive TNH patterns were dominant in the atmospheric circulation during winter 2013/14 (Figs. 1 and 2 ). The influence in the EA + TNH pattern have less SST and T2m anomaly signals over the tropical Pacific Ocean (Fig. 6b ). 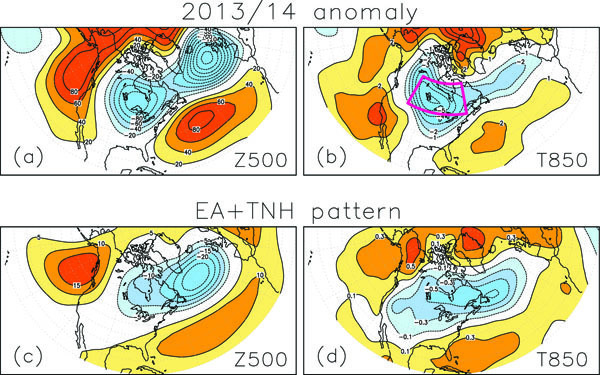 The EA + TNH pattern is quite similar to anomalies during the winter of 2013/14 (Fig. 6a ). 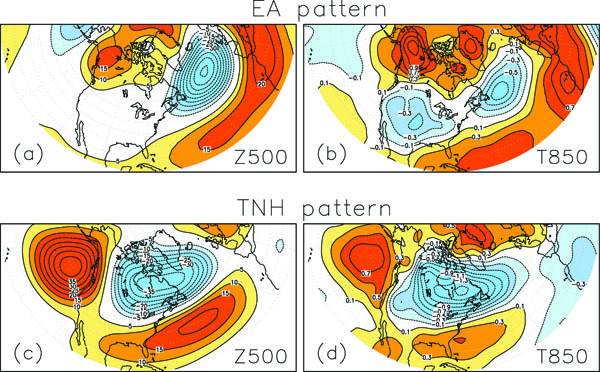 The EA and TNH patterns contribute to understanding anomalous weather changes such as the cold winter of 2013/14 over central North America. However, not all of the interannual variability in winter temperatures over North America can be ascribed to the EA and TNH. It has been suggested that the enhanced warming in high northern latitudes might be linked to atmospheric planetary-wave amplitude and persistence, and this phenomenon may be associated with extreme weather events in mid-latitudes [26Overland JE, Wood KR, Wang M. Warm Arctic – cold continents: climate impacts of the newly open Arctic sea. Polar Res 2011; 30: 15787. [http://dx.doi.org/10.3402/polar.v30i0.15787] , 27Francis JA, Vavrus SJ. Evidence linking Arctic amplification to extreme weather in mid-latitudes. Geophys Res Lett 2012; 39: L06801. [http://dx.doi.org/10.1029/2012GL051000] ]. The T850 anomalies of winter 2013/14 in high latitudes were warmer than normal (Fig. 3b ). The T850 regression anomalies associated with the EA and TNH patterns were also warmer in high latitudes (Figs. 3d , 4b , 4d ). The warm anomalies in high latitudes may also contribute to the extreme cold winter over North America in 2013/14. This study is supported by the Canada Excellence Research Chairs (CERC) and the Canada Research Chairs (CRC) programs. It is a contribution from the Arctic Science Partnership (ASP) and ArcticNet. We thank J. Walsh, E. Carmack, D. Babb, M. Honda, B. Taguchi, J. Lukovich, B. Horton and two anomalous reviewers for helpful comments and suggestions. Wettstein JJ, Mearns LO. The influence of the North Atlantic-Arctic Oscillation on mean, variance, and extremes of temperature in the northeastern United States and Canada. J Clim 2002; 15: 3586-600. Wallace JM, Gutzler DS. Teleconnections in the geopotential height field during the Northern Hemisphere winter. Mon Weather Rev 1981; 109: 784-812. Loikith PC, Broccoli AJ. The influence of recurrent modes of climate variability of the occurrence of winter and summer extreme temperatures over North America. J Clim 2014; 27: 1600-18. Shabbar A, Bonsal B. Associations between low frequency variability modes and winter temperature extremes in Canada. Atmos-ocean 2004; 42(2): 127-40. Yu B, Zhang X, Lin H, Yu J-Y. Comparison of wintertime North America climate impacts associated with multiple ENSO indices. Atmos-ocean 2015; 53(4): 426-45.
 van Oldenborgh GJ, Haarsma R, de Varies H, Allen MR. Cold extremes in North America vs. mild weather in Europe: the winter of 2013-2014 in the context of a warming world. Bull Am Meteorol Soc 2015; 95: 707-14. Wallace JM, Held IM, Thompson DWJ, Trenberth KE, Walsh JE. Global warming and winter weather. Science 2014; 343(6172): 729-30. Palmer T. Atmospheric science. Record-breaking winters and global climate change. Science 2014; 344(6186): 803-4. Screen JA, Deser C, Sun L. Reduced risk of North American cold extremes due to continued Arctic sea ice loss. Bull Am Meteorol Soc 2015; 96(9): 1489-503. Lee MY, Hong CC, Hsu HH. Compounding effects of warm sea surface temperature and reduced sea ice on the extreme circulation over the extratropical North Pacific and North America during the 2013-2014 boreal winter. Geophys Res Lett 2015; 42: 1612-8. Yu B, Zhang X. A physical analysis of the severe 2013/2014 cold winter in North America. J Geophys Res Atmos 2015; 120: 10149-65. Hartmann DL. Pacific sea surface temperature and the winter of 2014. Geophys Res Lett 2015; 42: 1894-902. Seager R, Hoerling M, Schubert S, et al. Causes of the 2011-14 California drought. J Clim 2015; 28: 6997-7024. Bond NA, Cronin MF, Freeland H, Mantua N. Causes and impacts of the 2014 warm anomaly in the NE Pacific. Geophys Res Lett 2015; 42: 1-7. Barnston AG, Livezey RE. Classification, seasonality and persistence of low-frequency atmospheric circulation patterns. Mon Weather Rev 1987; 115: 1083-126. Tivy A, Alt B, Howell S, Wilson K, Yackel J. Long-range prediction of the shipping season in Hudson Bay: a statistical approach. Weather Forecast 2007; 22: 1063-75. Moore GWK, Renfrew IA. Cold European winters: interplay between the NAO and the East Atlantic mode. Atmos Sci Lett 2012; 13: 1-8. Mo KC, Livezey RE. Tropical-extratropical geopotential height teleconnections during the Northern hemisphere winter. Mon Weather Rev 1986; 114: 2488-515. Rayner NA, Parker DE, Horton EB, et al. Global analyses of sea surface temperature, sea ice, and night marine air temperature since the late nineteenth century. J Geophys Res 2003; 108(D14): 2156-202. Horel JD, Wallace JM. Planetary-scale atmospheric phenomena associated with the Southern Oscillation. Mon Weather Rev 1981; 109: 813-29. Alexander MA, Bladé I, Newman M, Lanzante JR, Lau NC, Scott JD. The atmospheric bridge: The influence of ENSO teleconnections on air-sea interaction over the global oceans. J Clim 2002; 15: 2205-31. Frankignoul C, Sennéchael N, Kwon YO, Alexander MA. Influence of the meridional shifts of the Kuroshio and the Oyashio extensions on the atmospheric circulation. J Clim 2011; 24: 762-77. Wang SY, Hipps L, Gillies RR, Yoon JH. Probable causes of the abnormal ridge accompanying the 2013-2014 California drought: ENSO precursor and anthropogenic warming footprint. Geophys Res Lett 2014; 41: 3220-6. Overland JE, Wood KR, Wang M. Warm Arctic – cold continents: climate impacts of the newly open Arctic sea. Polar Res 2011; 30: 15787. Francis JA, Vavrus SJ. Evidence linking Arctic amplification to extreme weather in mid-latitudes. Geophys Res Lett 2012; 39: L06801.